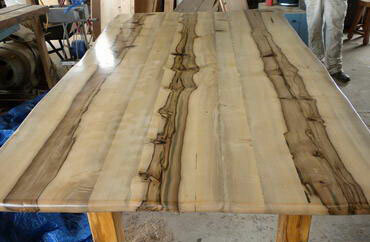 Live Edge Furniture | Millhouse Timber Co. creates slab furniture maintaining the beautiful natural edge. Live Edge Furniture | Custom hand made slab furniture with a natural edge. Each product is individually handcrafted into a unique piece of furniture, designed and built by a team of skilled local craftsmen. Be it domestic or commercial Millhouse can do the job. This small local industry is not about to become a production line operation but is intent on maintaining the fine craftsmanship and pride in their workmanship to produce extraordinarily designed pieces. "We are unique in that we collect all types of trees from people's backyards and farms, that would ordinarily be burnt. We save these trees and turn them into much loved pieces that everyone can enjoy". "We enjoy what we do. Our passion is what drives us. We put our heart and soul into our work."